Celebrate a 30th birthday in a big way by having all the guest wear the Look Who's 30 Headband. 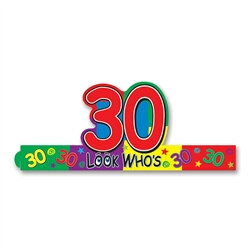 The Look Who's 30 Headband is a colorful party accessory that reads Look's Who's 30. The Look Who's 30 Headband is decorated with the number 30 printed multiple times. The Look Who's 30 Headband especially has to be worn by the individual celebrating there big 30th birthday. Wearing the headband will get you recognized for how good 30 looks. The Look Who's 30 Headband is adjustable to fit most head sizes. Let the guest know where the party is by displaying the Happy 30th Birthday Sign Banner.